The Phillipines makes a decent representative example of the US' first official exercise in colonial imperialism and formal empire [*], also referred to as "civilizational imperialism" - a project we're presently repeating. "Lest this seem to be the bellicose pipedream of some dyspeptic desk soldier, let us remember that the military deal of our country has never been defensive warfare. Since the Revolution, only the United Kingdom has beaten our record for square miles of territory acquired by military conquest. Our exploits against the American Indian, against the Filipinos, the Mexicans, and against Spain are on a par with the campaigns of Genghis Khan, the Japanese in Manchuria and the African attack of Mussolini. No country has ever declared war on us before we first obliged them with that gesture. Our whole history shows we have never fought a defensive war. And at the rate our armed forces are being implemented at present, the odds are against our fighting one in the near future." - -- Major General Smedley D. Butler, America's Armed Forces: 'In Time of Peace', 1935. 1898-1914: The Phillipines. To those who wonder "why dig the past": We engage in revisiting and revising our past, i.e. historical "revisionism", to develop new emphases and raise new questions on assumptions and explanations for key historical issues and policies --given by our former colonial master America, government officials and authors of history books, then and now. In our homeland's case, we can not afford a "balanced" approach to history since in the past and present years, our homeland's history, as it refers to Philippine-US relationships, has been imbalanced in favor of the Americans, who as far as we baby boomers can remember, are only "the good guys" and "do-gooders" in history. It is time for us, especially for Filipinos-in-the-Philippines to recover our history, a nationalist history, which necessitates uncovering the lies and myths about America; since the American arrival into and 50-year occupation of our homeland, the sweet nothings about "Philippine-American Special Relations," etc. perpetuated through our school textbooks, mass media, government pronouncements, and Filipinos with Americanized minds, etc. We Filipinos, here and abroad, past and present, relied and continue to use these official explanations that lead only to our ignorance of hidden truths and knowledge of untruths, thus perpetuating the post-WW2 neocolonial conditions that brought only worsening impoverishment to the masses; foreign control of the national economy and its plunder of our national patrimony (of course, with the help of the local collaborators/traitors to our homeland and native majority). History has been one of my favorite subjects in high school, and to this day it continues to be one of my great interests. In retrospect, I think the study of History, whether of the Philippines, of another country or that of the World, was badly taught since the stress has been mainly on memorizing names, dates and events. This teaching method made History to become/remain unpopular among many students and most important, to losing its true value for the future adult citizens and members of society. It was only when battles during the Vietnam War became a daily news item did my outlook towards History in general take a different spin. From then on, even while attending a college of engineering, I would spend time and money reading about the Vietnam War (more aptly, American intervention) and especially, about the causes or roots of this war. My great interest in history also led me into appreciating the other branches of the social sciences or the humanities, i.e. philosophy, psychology, etc, those subject matters that go deep into "what is man?" and comprise mainly the so-called"liberal education." (see History and Liberal Learning). To digress a bit: Many of those who attended the Uiversity of the Philippines have had a taste of liberal education and thus seem more attuned with societal issues. And in general, some or many who are for technical education may have found them boring too. It partly explains why we engineers --wherever we graduated from-- tend to be generally unqualified in human/organizational management uinless we study and learn. Two truisms: One where it is said "history repeats itself." Another where I would say "history does not have to repeat itself." Man makes history not the other way around (I do not believe in absolute historical determinism). A rough analogy: in the project engineering practice of better managed organizations, after project completion we sit down and talk about "lessons learned," to identify the good and the bad in the project just closed out for the purpose of not repeating mistakes. It should make us wonder why we do not use our scientific/technical approach or thinking in our social analysis and problem-solving. It maybe due to the case when most of the time human problems are much more complex than most technical/inanimate problems. In human problems wisdom in problem-solving is acquired only from a combo of education, time and experience. Though again, acquired knowledge also may oftentimesrequire the will, i.e. "political will," of the rulers --and of the active citizenry to press the rulers-- to implement it. Back to our history study. The reason I mention the above is the fact that we Filipinos grew up and were schooled in books, including those on Philippine history, written primarily by American and Americanized authors. History, come to think about it if seriously studied, provides one an understanding of a people, a place, a culture. A history to understand ourselves: why are we what we are? what brought us here - to our current predicament? Thinking about what transpired in the past provides a history buff a way of linking isolated, if not apparently unrelated events or historical milestones and therefore gives meaning and direction to the “who, what, when, where, how and why” questions concerning such past events. Learning and understanding history help provide a fresh perspective, the identification of a common thread, on recent and current events. Such obtained knowledge when applied to society can help formulate some and fundamental, even radical but necessary, approaches to problem solving of society’s current ills. As to our Philippine history, I believe and think that the 50-year American intervention, occupation and colonization of our homeland need a deeper rethinking if one wants to understand the seemingly confusing and incomprehensibly perennial predicament of Filipinos in the Philippines. The restudy of Philippine-American History by us Filipinos should aptly begin with the unknown and underlying rationalization and/or justification by Social Darwinism; the ignored and glossed over shift to expansionism by the formerly anti-imperialist and isolationist America; most especially its dominant racist mindset for both market- and military-driven expansions explained away by the so-called Manifest Destiny towards the Pacific Rim during the later decades of the 19th century. Note that decades before, America declared and warned the Europeans, through its Monroe Doctrine, that the western hemisphere -all the Americas- was its sole domain, its "backyard." The gradual shift at the turn of the 20th century from American isolationism to American imperialism, joining the exclusive imperialist club of England, France, Spain,etc. as the new global bully in the block, was demonstrated with the arrival of American armed forces in the Philippine islands, the latter's political trickery towards the Katipuneros. The native Filipinos who had (have to this day) naïve sentimentality thus faith in the American revolutionary heritage led to their failure to perceive the fading of so-called heritage and the rising new American reality. The new American reality of imperialism, the ordinary American does not recognize/realize it due to his ignorance, imposed its subsequent brutal war against the Filipino natives, and with the subtle Americanization (cultural imperialism) of the Filipino natives -through public education--a new, more efficient and effective method, i.e. cheaper and not requiring American occupation troops in foreign soil (with native military substitutes beholden to the American military) and long-lasting way of re-colonization, i.e. neocolonialism aka neoliberalism, that strongly persists up to the present. As a footnote, George W. Bush in his brief visit and speech to the Philippine Congress in 2003 spoke of our homeland as a model for Iraq. Thus America today pursues Iraqi occupation by American troops, now trapped in a quagmire as in Vietnam, after its brief but amoral intervention and invasion, and trying to impose its self-righteous belief that it has the best way for all civilizations and societies; an excuse for its ultimate goal of controlling Iraqi Oil, the second largest proven oil reserve in the world (second to Saudi Arabia). During the 2003 invasion, it is worth remembering that one of the very first places that the US troops took over is the Iraqi Oli Ministry and of course, all its documents. And the Bush administration can do so thanks to the dominance of a similar ignorance of the American mind. A picture of a “water detail,” reportedly taken in May 1901, in Sual, the Philippines. “It is a terrible torture,” one soldier wrote. "His sufferings must be that of a man who is drowning, but cannot drown." - Lt. Grover Flint, Philippine-American War. 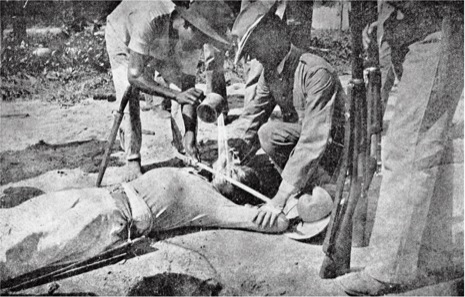 Many Americans were puzzled by the news, in 1902, that United States soldiers were torturing Filipinos with water. The United States, throughout its emergence as a world power, had spoken the language of liberation, rescue, and freedom. This was the language that, when coupled with expanding military and commercial ambitions, had helped launch two very different wars. The first had been in 1898, against Spain, whose remaining empire was crumbling in the face of popular revolts in two of its colonies, Cuba and the Philippines. The brief campaign was pitched to the American public in terms of freedom and national honor (the U.S.S. Maine had blown up mysteriously in Havana Harbor), rather than of sugar and naval bases, and resulted in a formally independent Cuba. The Americans were not done liberating. Rising trade in East Asia suggested to imperialists that the Philippines, Spain’s largest colony, might serve as an effective “stepping stone” to China’s markets. U.S. naval plans included provisions for an attack on the Spanish Navy in the event of war, and led to a decisive victory against the Spanish fleet at Manila Bay in May, 1898. Shortly afterward, Commodore George Dewey returned the exiled Filipino revolutionary Emilio Aguinaldo to the islands. Aguinaldo defeated Spanish forces on land, declared the Philippines independent in June, and organized a government led by the Philippine élite. During the next half year, it became clear that American and Filipino visions for the islands’ future were at odds. U.S. forces seized Manila from Spain—keeping the army of their ostensible ally Aguinaldo from entering the city—and President William McKinley refused to recognize Filipino claims to independence, pushing his negotiators to demand that Spain cede sovereignty over the islands to the United States, while talking about Filipinos’ need for ”Benevolent Assimilation”. Aguinaldo and some of his advisers, who had been inspired by the United States as a model republic and had greeted its soldiers as liberators, became increasingly suspicious of American motivations. When, after a period of mounting tensions, a U.S. sentry fired on Filipino soldiers outside Manila in February, 1899, the second war erupted, just days before the Senate ratified a treaty with Spain securing American sovereignty over the islands in exchange for twenty million dollars. In the next three years, U.S. troops waged a war to “free” the islands’ population from the regime that Aguinaldo had established. The conflict cost the lives of hundreds of thousands of Filipinos and about four thousand U.S. soldiers. Within the first year of the war, news of atrocities by U.S. forces—the torching of villages, the killing of prisoners—began to appear in American newspapers. Although the U.S. military censored outgoing cables, stories crossed the Pacific through the mail, which wasn’t censored. Soldiers, in their letters home, wrote about extreme violence against Filipinos, alongside complaints about the weather, the food, and their officers; and some of these letters were published in home-town newspapers. On occasion, someone—a local antiwar activist, one suspects—forwarded these clippings to centers of anti-imperialist publishing in the Northeast. But the war’s critics were at first hesitant to do much with them: they were hard to substantiate, and they would, it was felt, subject the publishers to charges of anti-Americanism. This was especially true as the politics of imperialism became entangled in the 1900 Presidential campaign. As the Democratic candidate, William Jennings Bryan, clashed with the Republican incumbent over imperialism, which the Democrats called “the paramount issue,” critics of the war had to defend themselves against accusations of having treasonously inspired the insurgency, prolonged the conflict, and betrayed American soldiers. But, after McKinley won a second term, the critics may have felt that they had little to lose. Ultimately, outraged dissenters—chief among them the relentless Philadelphia-based reformer Herbert Welsh—forced the question of U.S. atrocities into the light. Welsh, who was descended from a wealthy merchant family, might have seemed an unlikely investigator of military abuse at the edge of empire. His main antagonists had previously been Philadelphia’s party bosses, whose sordid machinations were extensively reported in Welsh’s earnest upstart weekly, City and State. Yet he had also been a founder of the “Indian rights” movement, which attempted to curtail white violence and fraud while pursuing Native American “civilization” through Christianity, U.S. citizenship, and individual land tenure. An expansive concern with bloodshed and corruption at the nation’s periphery is perhaps what drew Welsh’s imagination from the Dakotas to Southeast Asia. He had initially been skeptical of reports of misconduct by U.S. troops. But by late 1901, faced with what he considered “overwhelming” proof, Welsh emerged as a single-minded campaigner for the exposure and punishment of atrocities, running an idiosyncratic investigation out of his Philadelphia offices. By early 1902, three assistants to Welsh were chasing down returning soldiers for their testimony, and Philippine “cruelties” began to crowd Philadelphia’s party bosses from the pages of City and State. At about the same time, Senator George Frisbie Hoar, of Massachusetts, an eloquent speaker and one of the few Republican opponents of the war, was persuaded by “letters in large numbers” from soldiers to call for a special investigation.He proposed the formation of an independent committee, but Senator Henry Cabot Lodge, another Massachusetts Republican, insisted that the hearings take place inside his own, majority-Republican Committee on the Philippines. For the next ten weeks, prominent military and civilian officials expounded on the progress of American arms, the illegitimacy of Aguinaldo’s government, its victimization of Filipinos, and the population’s incapacity for self-government and hunger for American tutelage. Still, the subject of what was called, with a late-Victorian delicacy, “cruelties” by U.S. troops arose a few days into the hearings, at the outset of three weeks’ testimony by William Howard Taft. A Republican judge from Ohio, Taft had been sent to the islands to head the Philippine Commission, the core of the still prospective “postwar” government. That cruelties have been inflicted; that people have been shot when they ought not to have been; that there have been in individual instances of water cure, that torture which I believe involves pouring water down the throat so that the man swells and gets the impression that he is going to be suffocated and then tells what he knows, which was a frequent treatment under the Spaniards, I am told—all these things are true. Taft then immediately tried to contain the moral and political implications of the admission. Military officers had repeatedly issued statements condemning “such methods,” he claimed, backing up their warnings with investigations and courts-martial. He also pointed to “some rather amusing instances” in which, he maintained, Filipinos had invited torture. Eager to share intelligence with the Americans, but needing a plausible cover, these Filipinos, in Taft’s recounting, had presented themselves and “said they would not say anything until they were tortured.” In many cases, it appeared, American forces had been only too happy to oblige them. The document, entitled “Charges of Cruelty, Etc., to the Natives of the Philippines,” was an unsubtle exercise in the politics of proportion. A meager forty-four pages related to allegations of torture and abuse of Filipinos by U.S. soldiers; almost four hundred pages were devoted to records of military tribunals convened to try Filipinos for “cruelties” against their countrymen. If the committee sought atrocities, Root suggested, it need look no further than the Filipino insurgency, which had been “conducted with the barbarous cruelty common among uncivilized races.” The relatively slender ledger of courts-martial was not, for Root, evidence of the unevenness of U.S. military justice on the islands. The scale of abuses in the Philippines remains unknowable, but, as early as March, rhetoric like Root’s was being undercut by further revelations from the islands. When Major Littleton Waller, of the Marines, appeared before a court-martial in Manila that month, unprecedented public attention fell on the brutal extremities of U.S. combat, specifically on the island of Samar in late 1901. In the wake of a surprise attack by Filipino revolutionaries on American troops in the town of Balangiga, which had killed forty-eight of seventy-four members of an American Army company, Waller and his forces were deployed on a search-and-destroy mission across the island. During an ill-fated march into the island’s uncharted interior, Waller had become lost, feverish, and paranoid. Believing that Filipino guides and carriers in the service of his marines were guilty of treachery, he ordered eleven of them summarily shot. The disclosures stirred indignation in the United States but also prompted rousing defenses. Smith was court-martialed that spring, and was found guilty of “conduct to the prejudice of good order and military discipline.” Yet the penalty was slight: he was simply reprimanded and made to retire early. Root then used the opportunity to tout the restraint that the U.S. forces had shown, given their “desperate struggle” against “a cruel and savage foe.” The Lodge committee, meanwhile, maintained its equanimity, with a steady procession of generals and officials recounting the success and benevolence of American operations. That is what, on April 14th, made the testimony of Charles S. Riley, a clerk at a Massachusetts plumbing-and-steam-fitting company, so explosive. A letter from Riley had been published in the Northampton Daily Herald in March of the previous year, describing the water-cure torture of Tobeniano Ealdama, the presidente of the town of Igbaras, where Riley, then a sergeant in the 26th Volunteer Infantry, had been stationed. Herbert Welsh had learned of Riley, and enlisted him, among other soldiers, to testify before the committee. Amid the bullying questions of pro-war senators, Riley’s account of the events of November 27, 1900, unfolded, and it was startlingly at odds with most official accounts. Upon entering the town’s convent, which had been seized as a headquarters, Riley had witnessed Ealdama being bound and forced full of water, while supervised by a contract surgeon and Captain Edwin Glenn, a judge advocate. Ealdama’s throat had been “held so he could not prevent swallowing the water, so that he had to allow the water to run into his stomach”; the water was then “forced out of him by pressing a foot on his stomach or else with [the soldiers’] hands.” The ostensible goal of the water cure was to obtain intelligence: after a second round of torture, carried out in front of the convent by a “water detail” of five or six men, Ealdama confessed to serving as a captain in the insurgency. Riley’s testimony, which was confirmed by another member of the unit, was inconvenient, especially coming after official declarations about America’s “civilized” warfare. The next day, Secretary of War Root directed that a court-martial be held in San Francisco and cabled the general in charge of the Philippines to transport to the West Coast Glenn and any witnesses who could be located. “The President desires to know in the fullest and most circumstantial manner all the facts, nothing concealed and no man being for any reason favored or shielded,” Root declared. Yet in the cable Root assured the general, well in advance of the facts, that “the violations of law and humanity, of which these cases, if true, are examples, will prove to be few and occasional, and not to characterize the conduct of the army generally in the Philippines.” Most significant, though, was the decision, possibly at Glenn’s request, to shift the location of the court-martial from San Francisco to Catbalogan, in the Philippines, close to sympathetic officers fighting a war, and an ocean away from the accusing witnesses, whose units had returned home. The trial lasted a week. When Ealdama testified about his experience—“My stomach and throat pained me, and also the nose where they passed the salt water through”—Glenn interrupted, trying to minimize the man’s suffering by claiming (incorrectly) that Ealdama had stated that he had experienced pain only “as [the water] passed through.” Glenn defended his innocence by defending the water cure itself. He maintained that the torture of Ealdama was “a legitimate exercise of force under the laws of war,” being “justified by military necessity.” In making this case, Glenn shifted the focus to the enemy’s tactics. He emphasized the treachery of Ealdama, who had been tried and convicted by a military commission a year earlier as a “war traitor,” for aiding the insurgency. Meanwhile, Ealdama, twice tortured by Glenn’s forces, was serving a sentence of ten years’ hard labor; he had been temporarily released to enable him to testify against his torturer. The vote of the court-martial at Catbalogan had been unanimous, but at least one prominent dissenter within the Army registered his disapproval. Judge Advocate General George B. Davis, forwarding the trial records to Root, wrote an introductory memorandum that seethed with indignation. Furthermore, Glenn had described the water cure as “the habitual method of obtaining information from individual insurgents”—in other words, as “a method of conducting operations.” But the operational use of torture, Davis stressed, was strictly forbidden. Shall the victim be suspended, head down, over the smoke of a smoldering fire; shall he be tightly bound and dropped from a distance of several feet; shall he be beaten with rods; shall his shins be rubbed with a broomstick until they bleed? The questions were so vile and absurd—they were the kind that the Filipinos’ Spanish tormentors had once asked—that it seemed “hardly necessary to pursue the subject further.” The United States, he concluded, “can not afford to sanction the addition of torture to the several forms of force which may be legitimately employed in war.” Glenn’s sentence, however, stood. This would be perhaps the most intensive effort by the War Department to punish those who practiced the water cure in the Philippines. Confronted with the facts provided by the Waller, Smith, and Glenn courts-martial, and with the testimony of a dozen more soldier witnesses who had followed Riley, Administration officials, military officers, and pro-war journalists launched a vigorous campaign in defense of the Army and the war. Their arguments were passionate and wide-ranging, and sometimes contradictory. Some simply attacked the war’s critics, those who sought political advantage by crying out that “our soldiers are barbarous savages,” as one major general put it. Some contended that atrocities were the exclusive province of the Macabebe Scouts, collaborationist Filipino troops over whom, it was alleged, U.S. officers had little control. More generally, some people, while conceding that American soldiers had engaged in “cruelties,” insisted that the behavior reflected the barbaric sensibilities of the Filipinos. “I think I know why these things have happened,” Lodge offered in a Senate speech in May. In his private and public considerations of the question of “cruelties,” Theodore Roosevelt—who had been President since McKinley’s assassination, in September of 1901—lurched from intolerance for torture to attempts to rationalize it and outrage at the antiwar activists who made it a public issue. There was, of course, an easier way than argument to end the debate. On July 4, 1902 (as if on cue from John Philip Sousa), Roosevelt declared victory in the Philippines. Remaining insurgents would be politically downgraded to “brigands.” Although the United States ruled over the Philippines for the next four decades, the violence was now, in some sense, a problem in someone else’s country. Activists in the United States continued to pursue witnesses and urge renewed Senate investigation, but with little success; in February, 1903, Lodge’s Republican-controlled committee voted to end its inquiry into the allegations of torture. Responding to the verdict in the Glenn court-martial, Judge Advocate General Davis had suggested that the question it implicitly posed—how much was global power worth in other people’s pain? —Was one no moral nation could legitimately ask. I am not as intelligent as you, or many of your collegues, or someone with a degree of some sort BUT I consider myself smart, not book smart, just smart or you can say street smart. There's no argument that 'knowledge is power' but too much of everything is no(t) good either. Canada is what I call home (now) but Philippines will always be my beloved country. I served in the Canadian military for 14 years and sometimes I wish that I could serve the Philippines in some ways. Philippines being a 'third world country' a 'developing country' which will always and forever be until we *Filipinos* do something. It is my belief that 'a pen is mightier than a sword' will and can not work to our Motherland, The Philippines. Dr. Jose Rizal and many others during the Spanish colonialism tried and failed. Please feel free to correct my sentences. Whether I put what I feel in English or Filipino (Tagalog), grammatical mistakes will be there. Ang importante ay ang ibig nating maiparinig sa kapwa natin, mapa Pilipino man o hinde. Ang katotohonan! The truth is: The Philippines was and never truly free from the oppressor. We can look back in out history and learn many things from those who fought the Spaniards, Americans, Japanese and more Americans. And, WHAT! Fight and die for WHAT! FREEDOM...We must define what FREEDOM truly is. Then, we can talk about killing and dying for one country! I agree that we need to understand objectives. You alluded to freedom, what is freedom to you? Anyway, during his time, Rizal was essentially for reform, for acceptance and better treatment of his compatriots. Rizal today would be considered a "liberal." He did not fight for political and economic independence of the indio (now aka Filipino). Andres Bonifacio was a true revolutionary as he was for the ouster of the Spaniards, to end Spanish colonization; he failed because he was assassinated by Aguinaldo's followers (by his order). Apolinario Mabini was a reformer like Rizal for a start but became revolutionary thereafter. he was Aguinaldo's adviser but was later removed by Aguinaldo as requested by the other prominent ilustrados, who wanted to give up and accomodate/coopt to the new colonizers, the Americans. Mabini never waivered in his nationalism and was deported to Guam with General Ricarte and a few others who would not sell-out. I could go on and on but I have addressed similar issues before. If I may suggest, if you are truly interested in understanding your (our) homeland's history, to check out my posts as I have written many relevant issues. I write because concerned native Filipinos need to know the "who, what, where, why" of our past so we can understand the present and know "what, how, why, where" plan and do the fundamental, and necessarily radical, corrective actions for the future generations of native Filipinos. For a start, you may check out the three essential postings I have in the lead of each new post.